Night of Joy: Held September 7, 2012 and September 8, 2012, this annual music festival features live performances by contemporary Christian superstars in rock, pop and gospel. Mickey's Not-So-Scary Halloween Party: Held select nights in September and October 2012, this event features Halloween-themed festivities, including a parade, fireworks and trick-or-treating. Book your stay today to enjoy these events and so much more. *No group rates or other discounts apply. Advance reservations required. Excludes suites and 3 bedrooms. 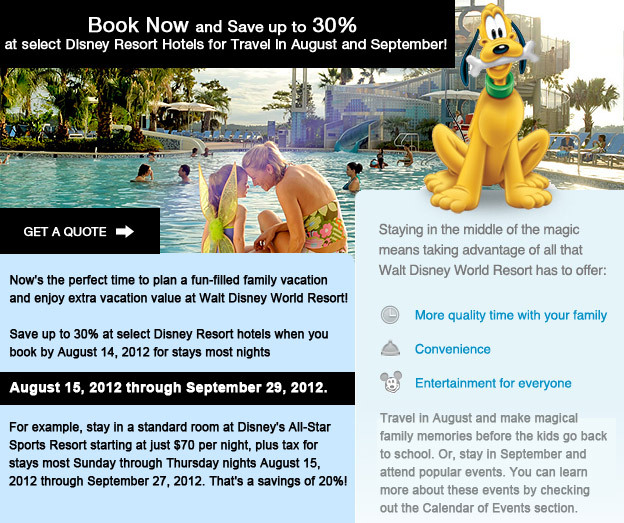 Additional per adult charges may apply if more than 2 adults per room at Disney Value, Moderate and Deluxe Resorts.